At home, at school, in kindergarten, children behave actively and at lunch they can pour out juice on themselves or put fatty sauce on a T-shirt. 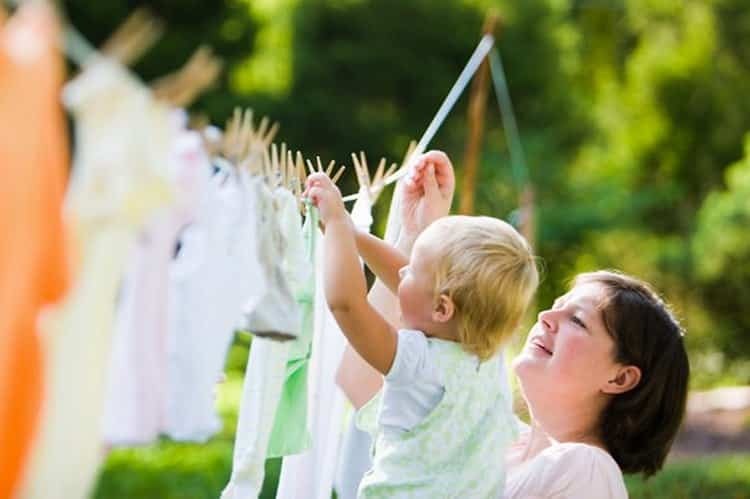 Therefore, mothers sooner or later begin to look for a recipe for how to remove stains from children's clothes so that they are perfectly washed off. Before you remove the spots on children's clothes, determine their origin. This will help you choose the right tool for removal. In fat marks, unlike fruit, there are no clear boundaries. They spread on matter, quickly fall in dust and become difficult to display. If the baby gets dirty with you, blot the dirt with a napkin and sprinkle with a pinch of salt. It absorbs the liquid, and the stain does not go too deep into the fabric fibers. How to remove stains on baby clothes? Clean the cloth with a dry cloth and then wipe it with a wet brush. Handle the thing from the inside. Pick up a suitable tool, moisten a piece of gauze in it and gently rub the edges of the pollution, gradually moving to the center. This will help avoid the spread of dirt and increase the volume of the stain. Important! Before using aggressive substances, be sure to test them on the inside of the seam. Do not forget that acetone will permanently ruin delicate silk and satin, and peroxide and soda can discolor bright clothing. Kids love apple juice and apples. Wash fresh stains easily with soap. Heat 1 l fresh milk, grate 25 g host. soap and put together the components. Soak a soiled T-shirt or shorts and leave for an hour on 1. Carefully wash the thing in this solution and rinse. Do not look for a long way to how to get rid of fruit stains from children's clothes, and use citric acid. It is safe for the skin of children and quickly oxidizes blots from juices. Wet the item, put citric acid on the dark mark and slowly rub it into the 10 fabric for minutes. Then wash the crystals and wash the clothes. If you want to know how to bring out fresh stains on baby clothes from a banana, try removing them with a mixture of soda and salt. Mix them in the same proportion, dilute with water until a homogeneous substance is formed and spread a thick layer of contamination. Wait until the composition dries, wash it off. 2 Art. l vinegar, stirred in 1 l of water, and put the product in the wash.
To remove old stains from children's clothes from a banana more difficult. Wet the fabric, take a Vanish stain remover, pour dirt on it and sprinkle with baby powder on top. Let the night lie down. In the morning, wash in the washing machine. This method is suitable for bright and high-quality colored material. Moms wondering how to remove stains from children's clothes, consisting of cherry or blueberry juice. If they have not yet dried up and adorn the natural fabric, boil water, lay the thing in the sink and water the pollution with boiling water until it brightens and disappears. Residual traces rub households. soap "Aistenok" for children and wash it thoroughly. Blots from synthetic berries are harvested by a gruel made from baking soda and water. If you need a method, how to remove stains from children's clothes from chocolate, tea and coffee, remember that it is desirable to soak fresh blots in salt water. Stir in 1 l of liquid 1 Art. l salt and place in the solution thing. Extend in an hour and, if something remains, use a stronger way. Squeeze out a ripe lemon 1 tsp. juice, gently heat the pure alcohol and put 5 drops in the juice. Lubricate the stain directly, wait 10 minutes and send the item to the laundry machine. On white fabric to remove stains from children's clothes from chocolate will help hydrogen peroxide. Pour it onto the contaminated material, wait a while and rinse. Glycerin can be used instead of peroxide. Warm up the preparation, moisten it abundantly with a stain, set aside a thing for a quarter of an hour and wash it in warm water. How to remove old stains on children's clothes in white? Get oxalic acid, dissolve half of the 1 tsp. in an incomplete glass of water and apply on pollution. Prepare a soap solution, add 1 Art. l ammonia, put the thing in it and do the laundry. Removing tea stains easy to produce with a mixture of 2 Art. l glycerin and half 1 tsp. ammonia. On the light material from long-term storage often appear yellow traces. It is difficult to get rid of them. There is a good recipe for how to remove yellow spots from children's things of unknown origin. 2 Art. l quality stain remover. To remove the stains from children's clothing, pour the boiled water on the 5 l mixture, stir with a wooden spatula and place the light things there. Keep them in solution until the water is warm, and with particularly persistent yellow divorces, leave for a day. Then wash in the usual way. Try to do so, and you will realize that you have found a method for removing old stains from children's clothes without much difficulty. He perfectly helps to put in order the sliders, blouses, bibs, diapers, stained with persistent brown marks. Than remove yellow spots with children's clothes that appeared on the collar and cuffs? Mix in equal quantities vodka and warm glycerin. Moisten cotton wool and blot dirty places. If milk drips onto the baby’s T-shirt, then lock the item with warm water. Do not use hot liquids for soaking. From it, milk proteins penetrate deep into the tissue and will be difficult to remove. To remove the milk stains on children's things, sewn from wool, soak them with heated glycerin and then rinse the hoses. soap and water. Bright things can be saved with a special solution. In 2 Art. l water dissolve 5 ammonia drops and 2 Art. l glycerol. Lubricate with dirt, put a clean snow-white cloth from inside and above the stain and iron it with a hot iron. Yellow marks from the milk depart from the colored material. Traces of eggs are destroyed by ammonia, diluted with water 1: 1. Fat blob firmly eats into the fabric. What is to remove such stains from children's clothing? Pour the dish washing liquid on it and rub it thoroughly. If it is not completely removed, sprinkle with talcum powder, put a sheet of paper on top and iron. Do not remove the 10 talc from the watch, then shake and brush the item. Stains from canned food and oil are derived from kerosene. Wet a piece of cloth, treat it with pollution and immediately wash the thing. Silk children's dresses and shirts can be easily cleaned with ordinary starch. Measure out 1 Art. l Dilute to a pasty mixture with water and apply on the soiled area with a soft sponge. Wait until the product dries, shake it off the clothes and wash it with powder. You can remove fresh stains from children's clothes from silk by heating the crumb of white bread, rolling a ball out of it and treating it with dirt. Clothes got dirty in the pen? Correct the situation! White spots from deodorant - how to effectively remove?